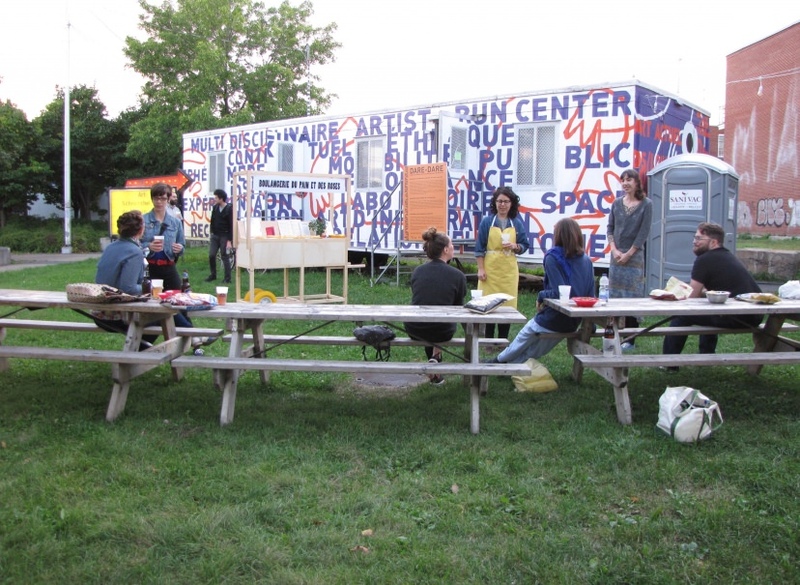 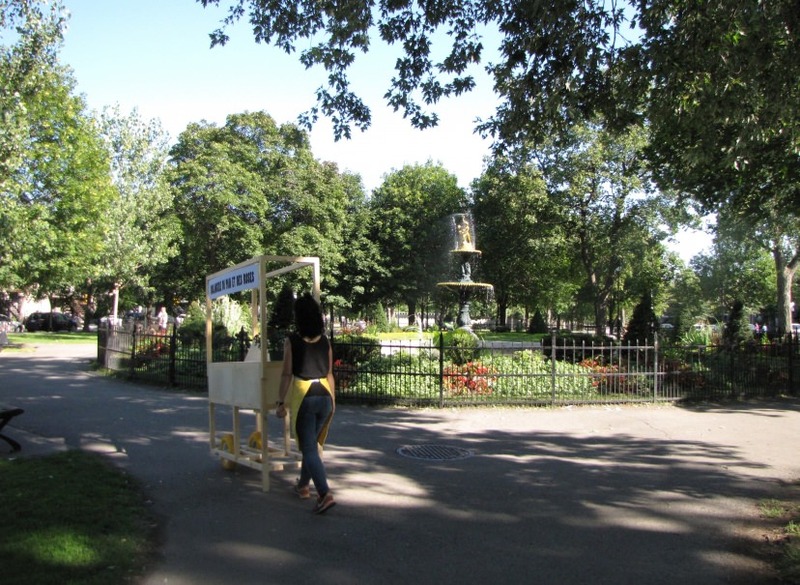 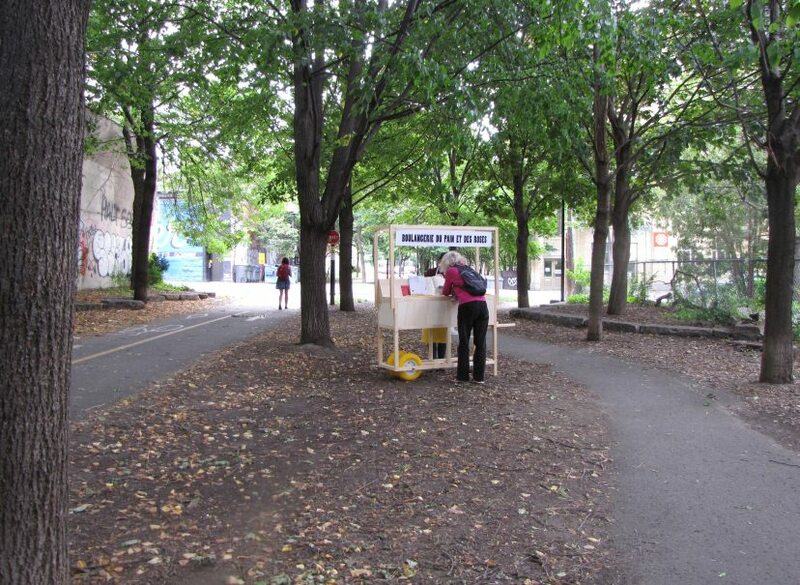 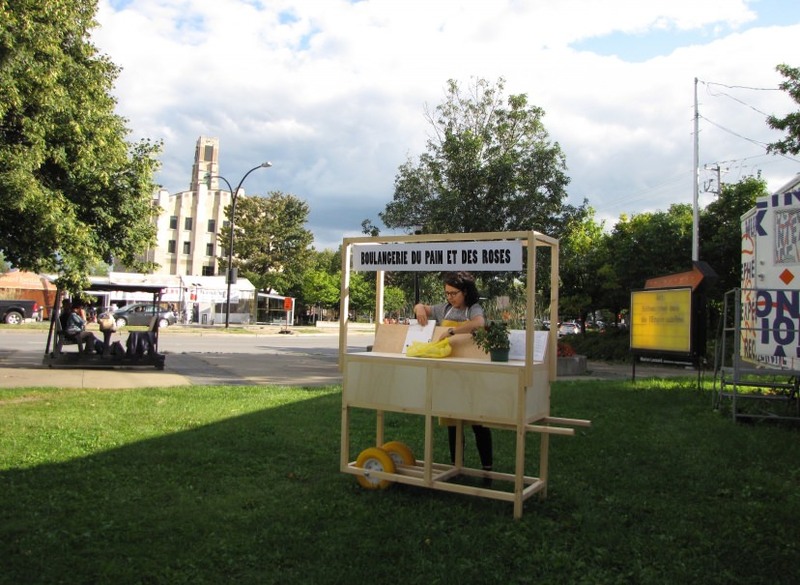 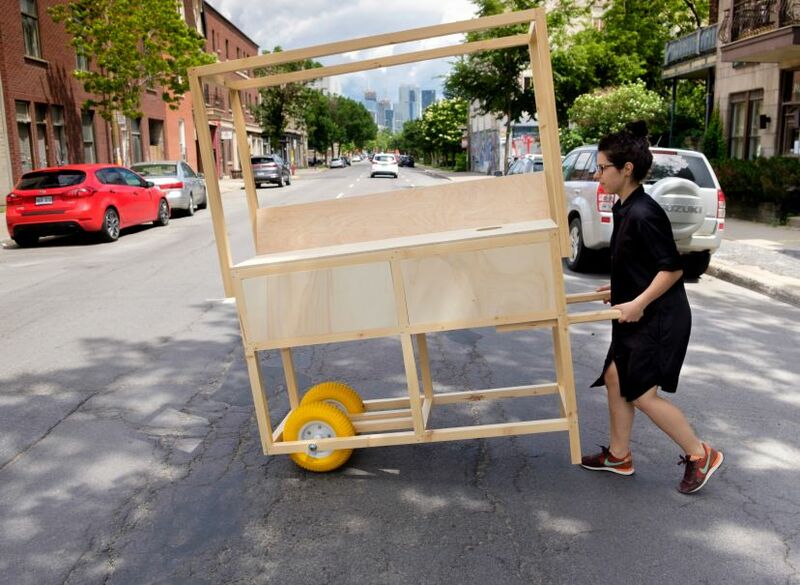 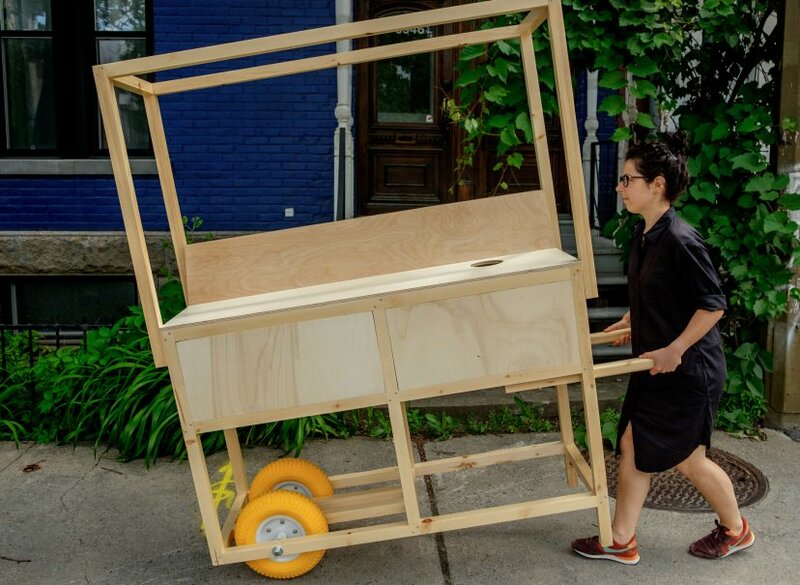 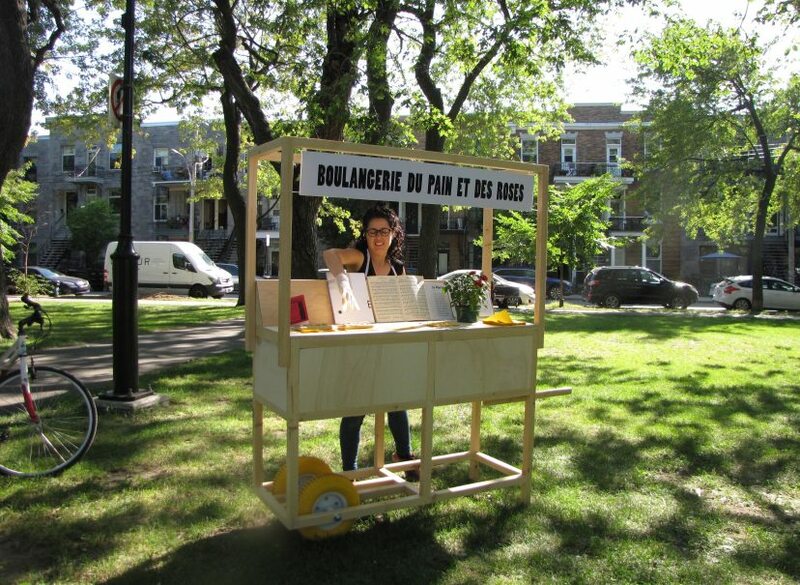 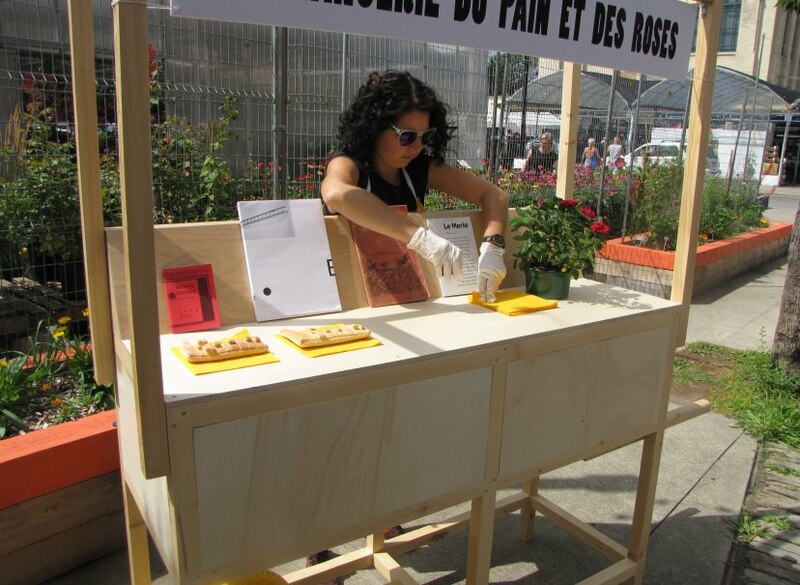 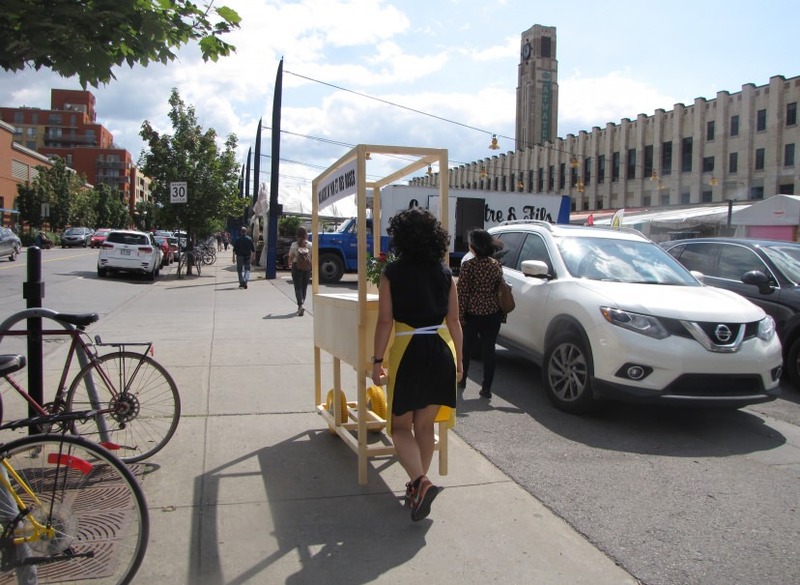 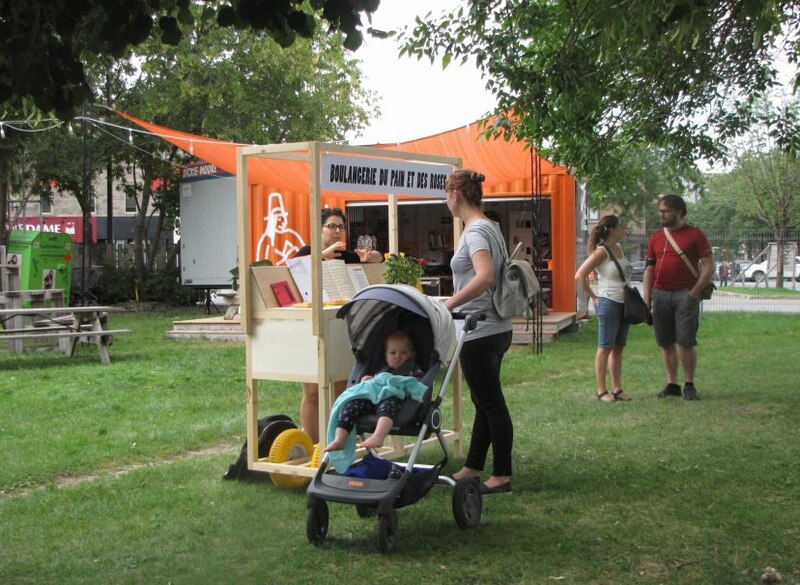 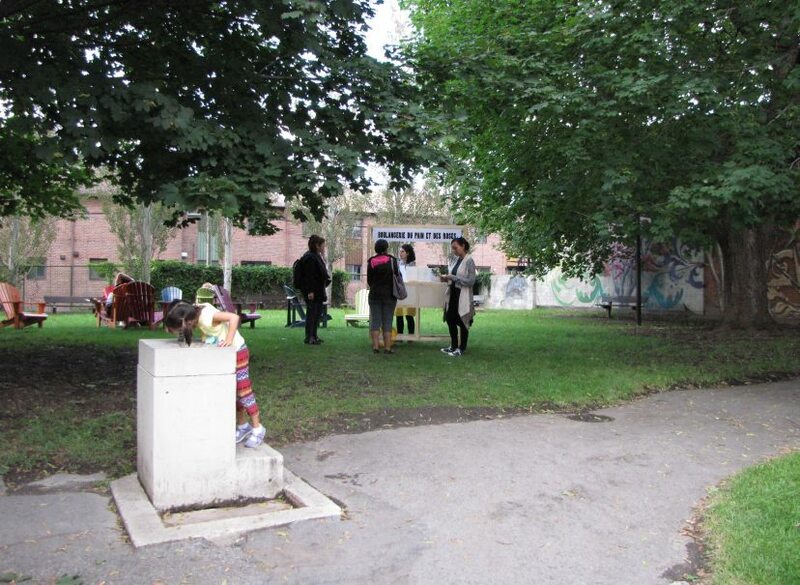 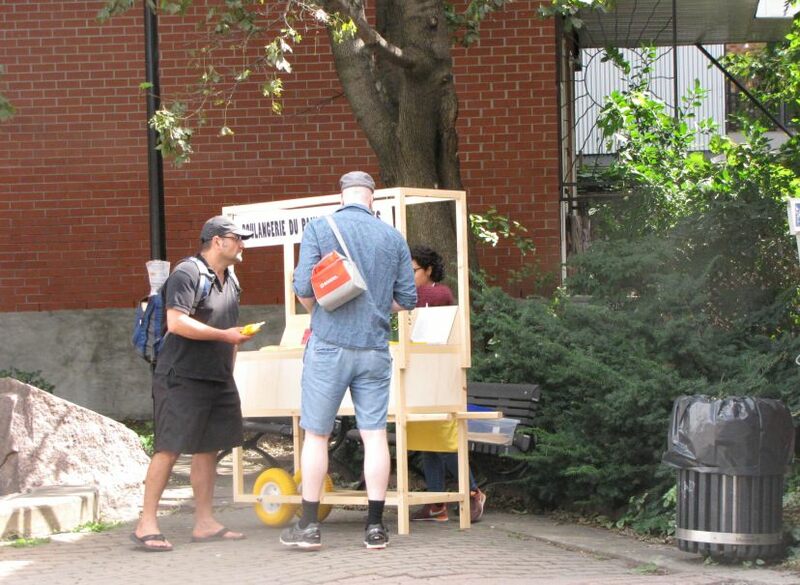 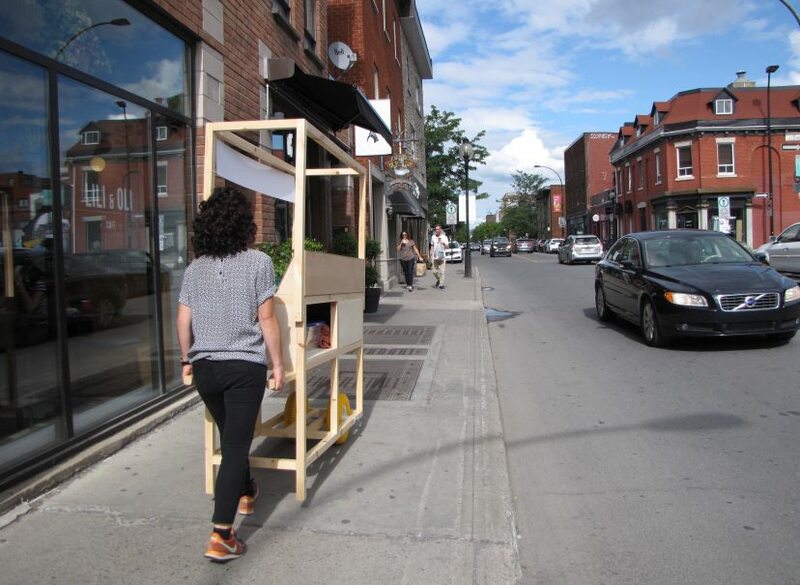 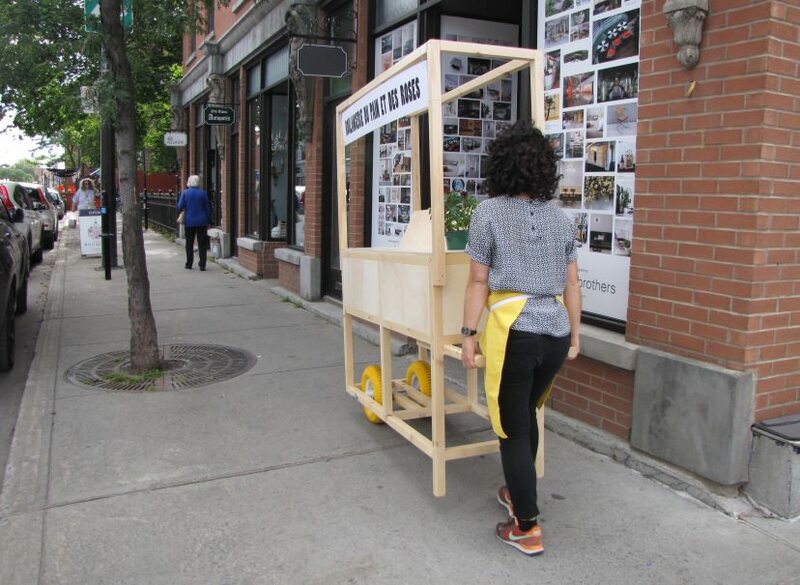 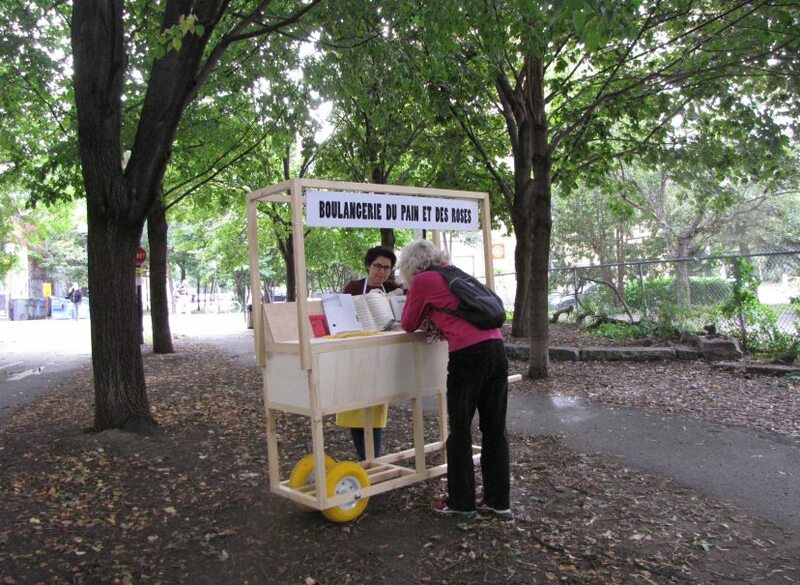 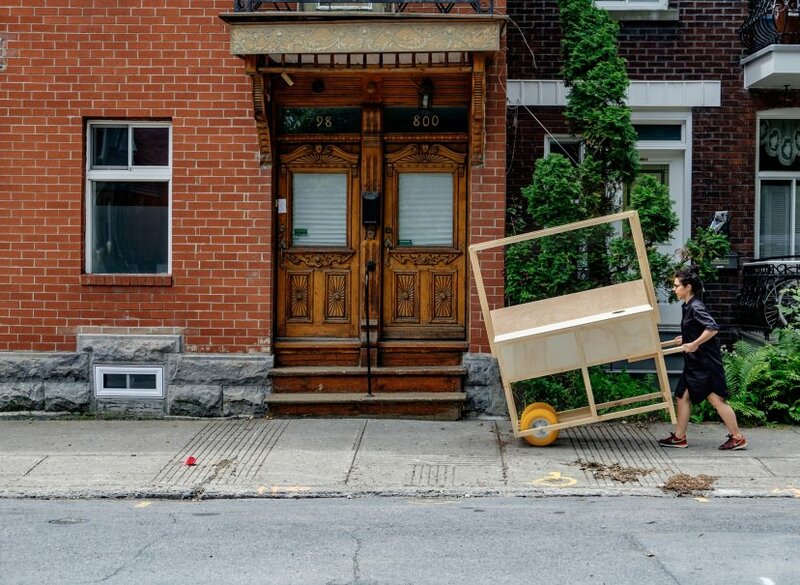 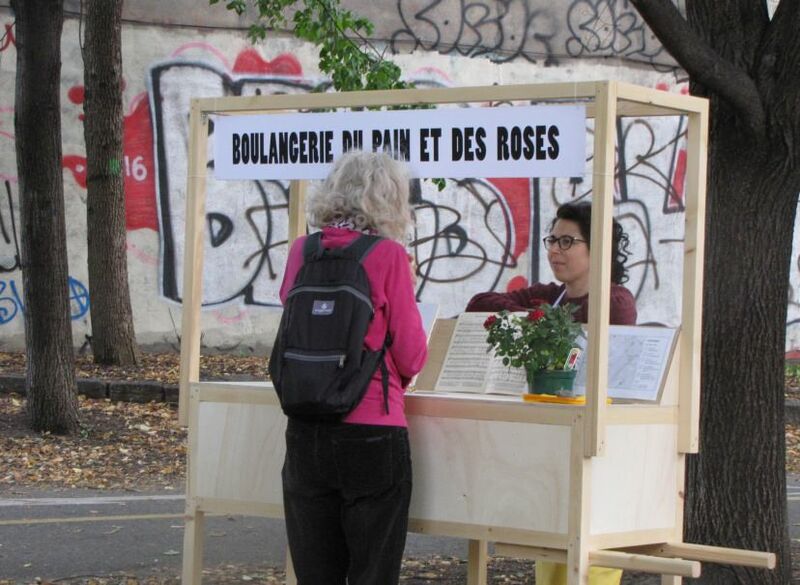 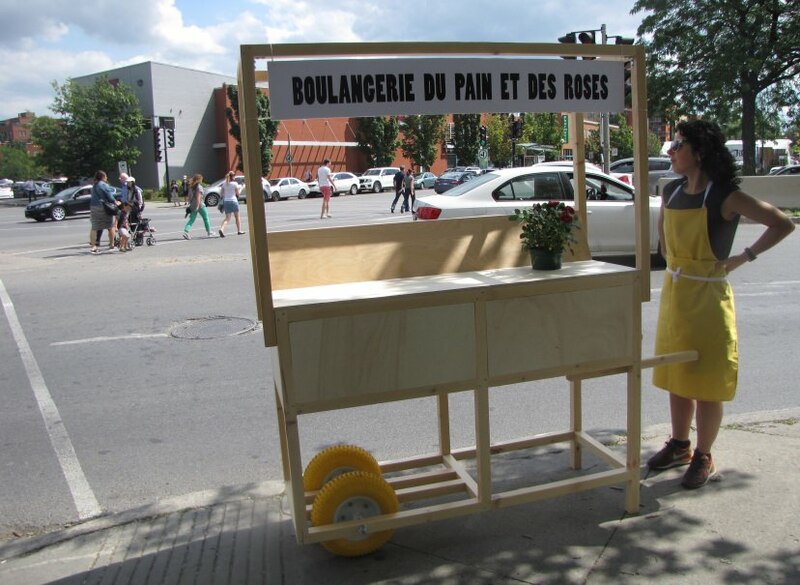 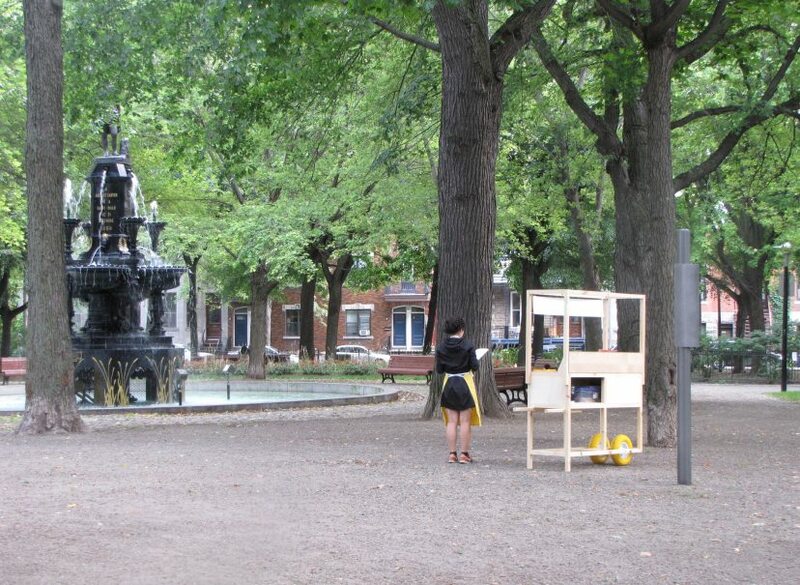 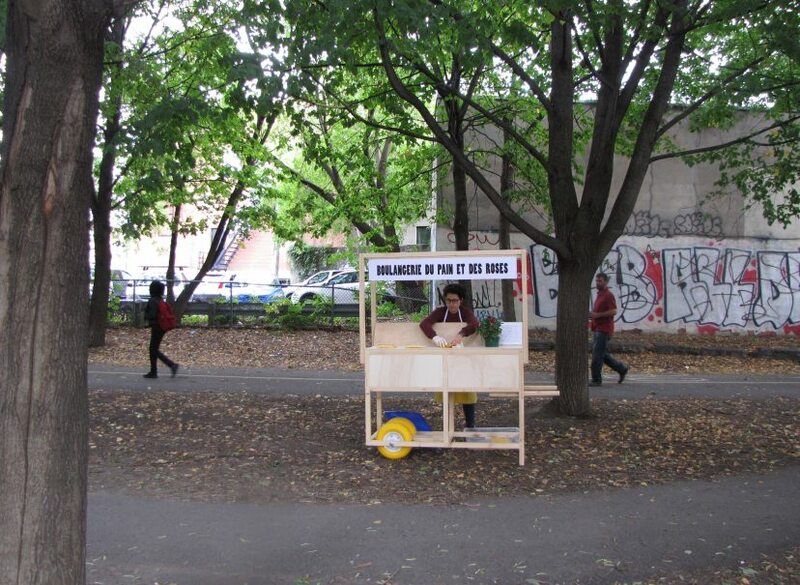 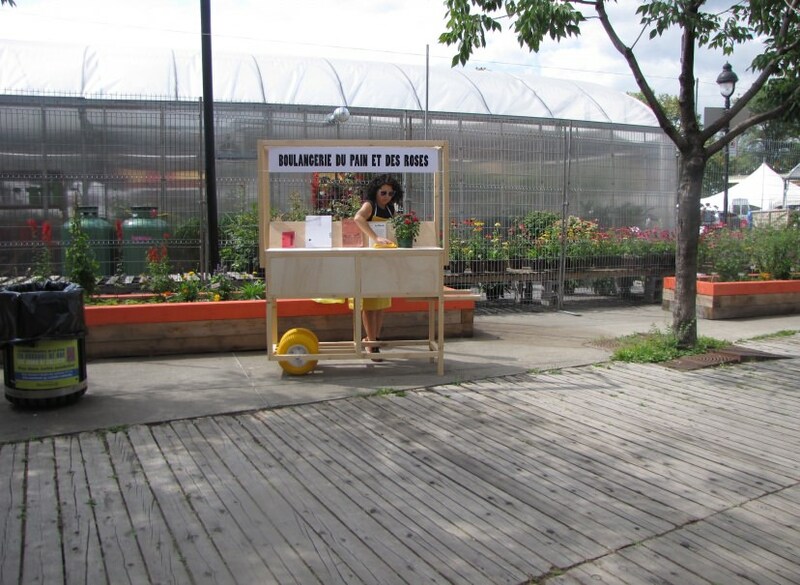 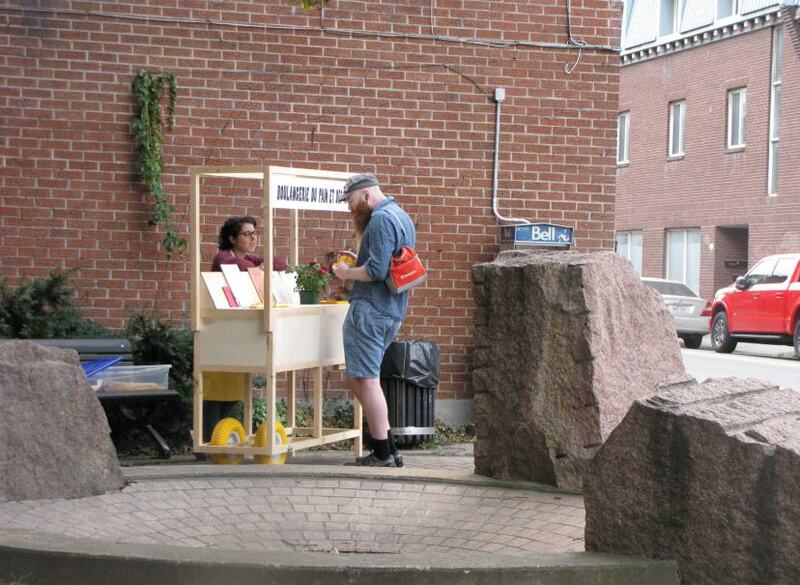 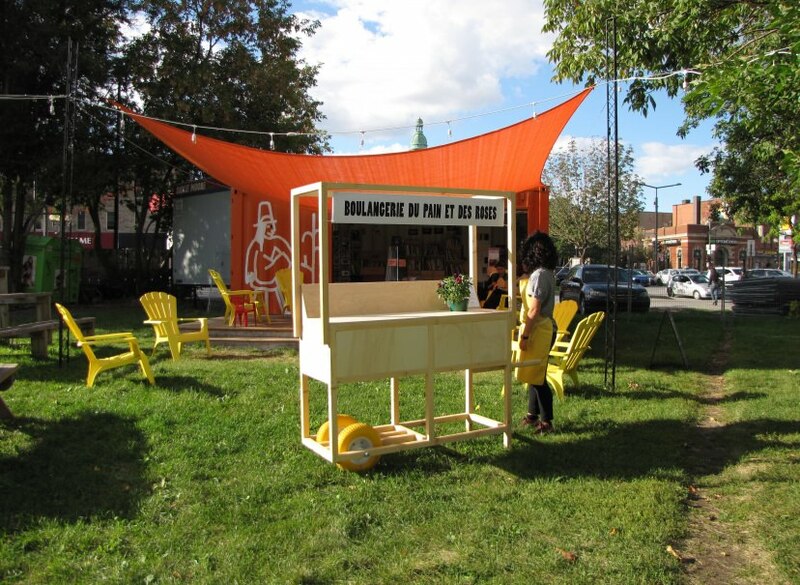 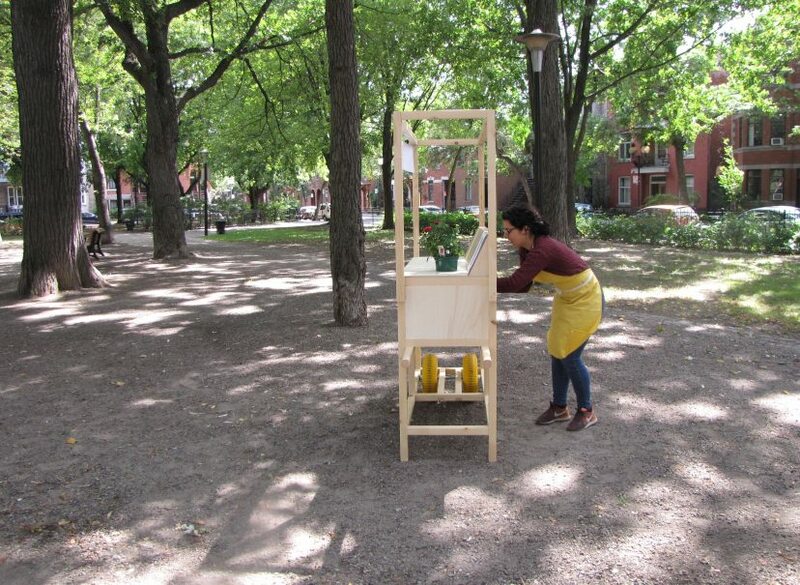 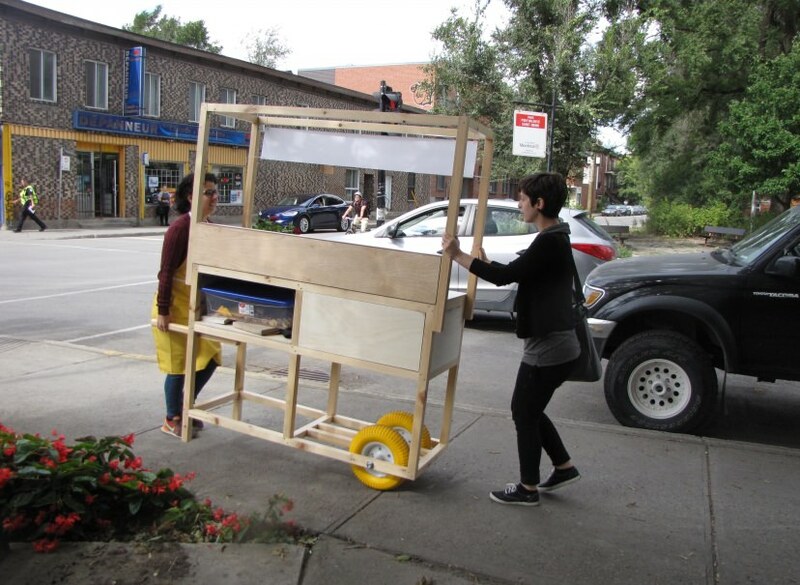 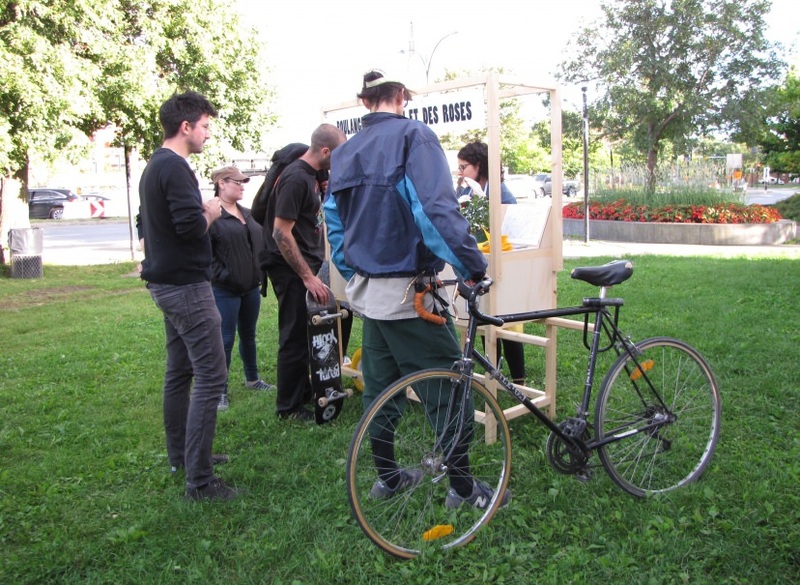 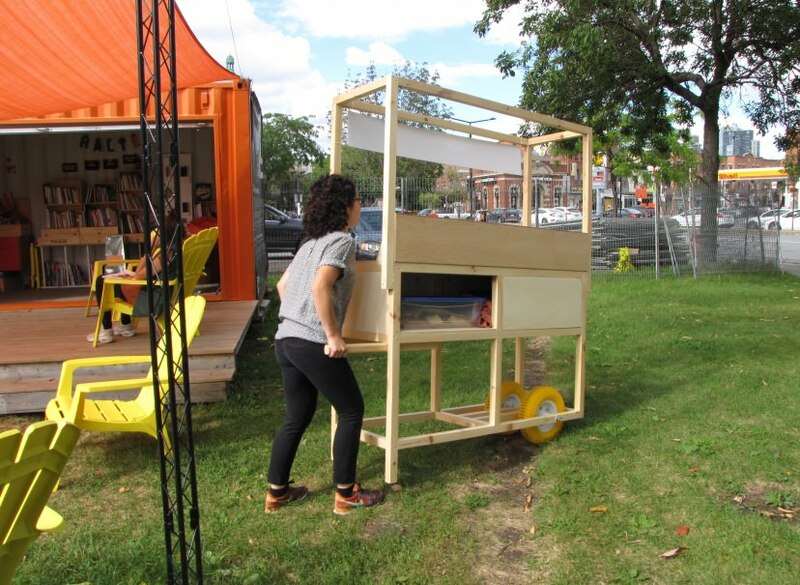 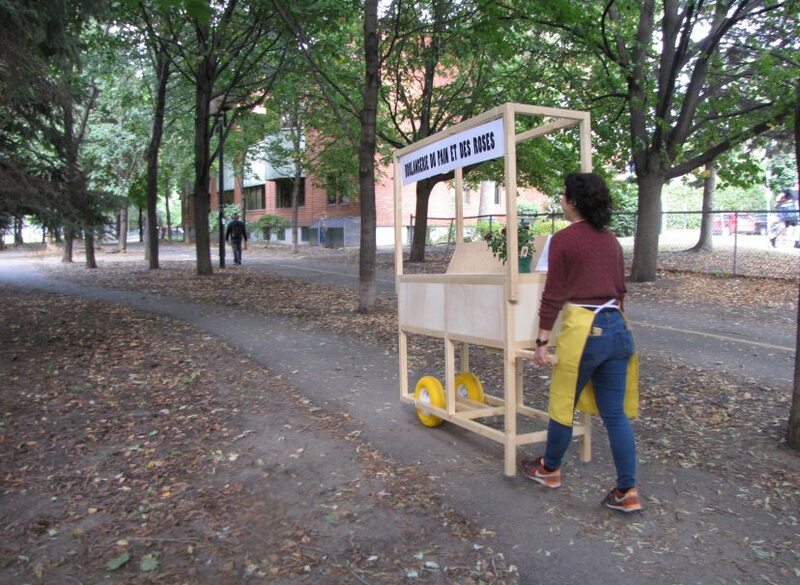 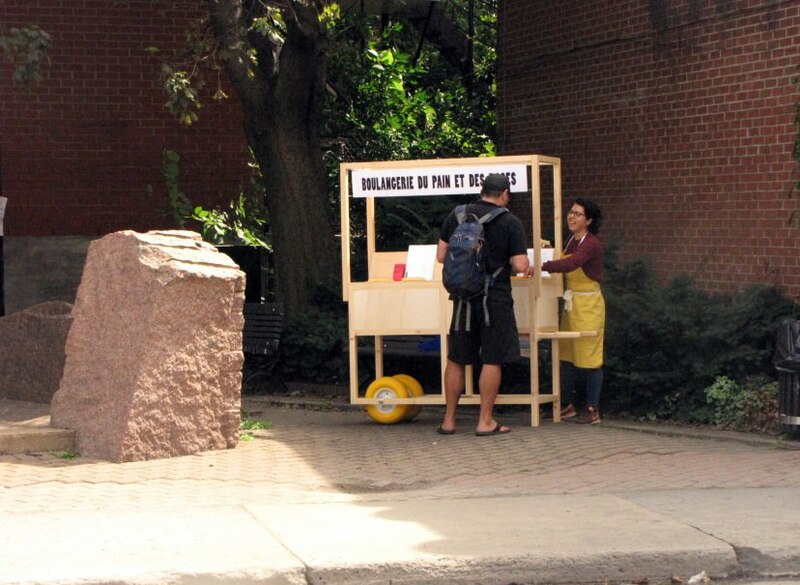 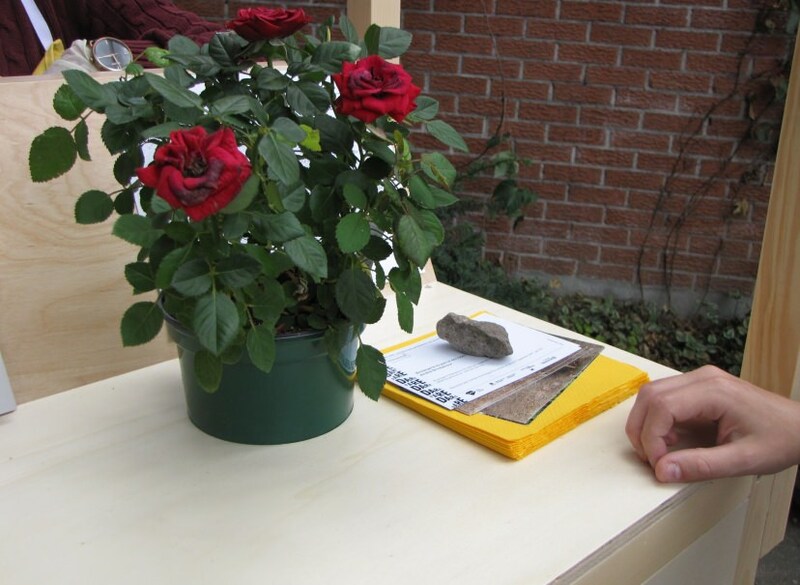 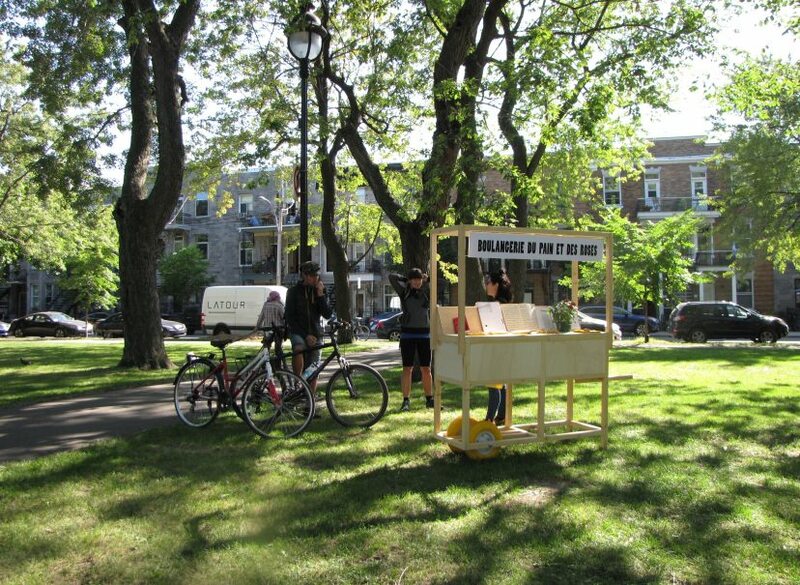 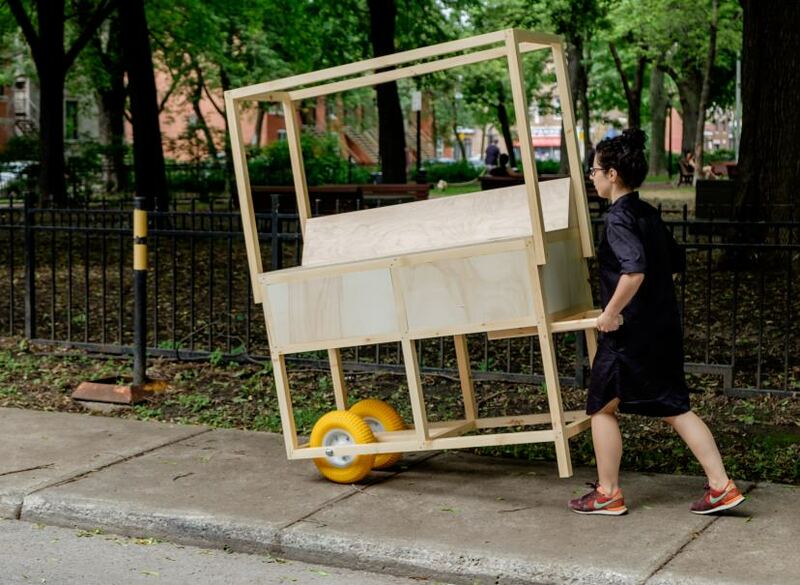 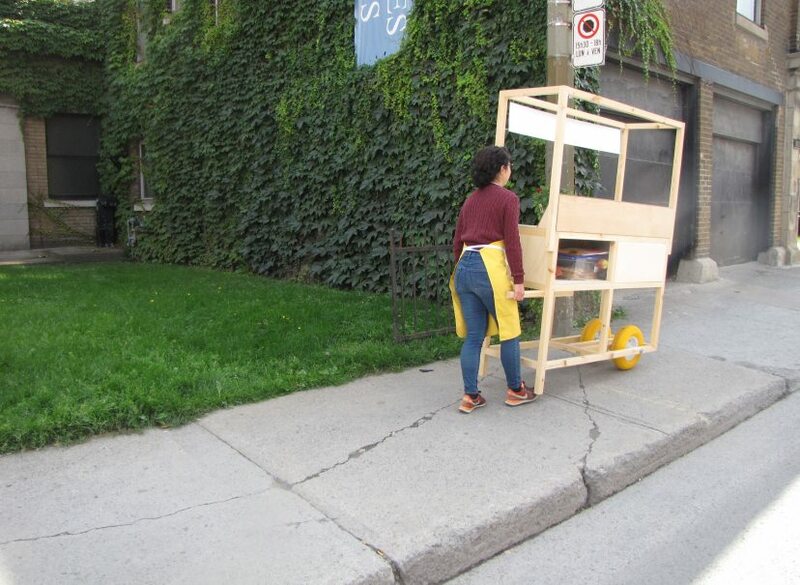 The Bread and Roses Bakery is a mobile platform to encourage discussion in public spaces about the working conditions of artists and cultural workers in the Saint-Henri district, through bread and other artistic events. 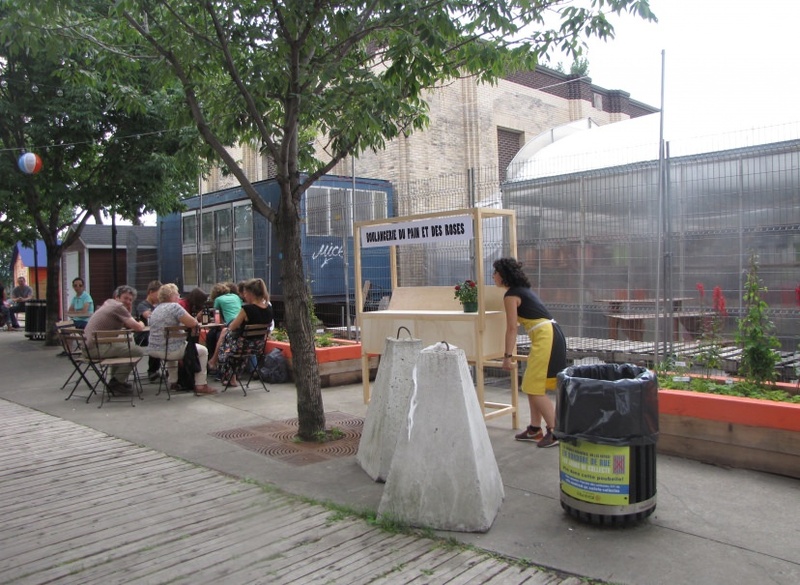 Following the deindustrialisation of Montreal, which began in the 1960s, artists replaced workers in several industrial buildings by using them as workshop spaces. 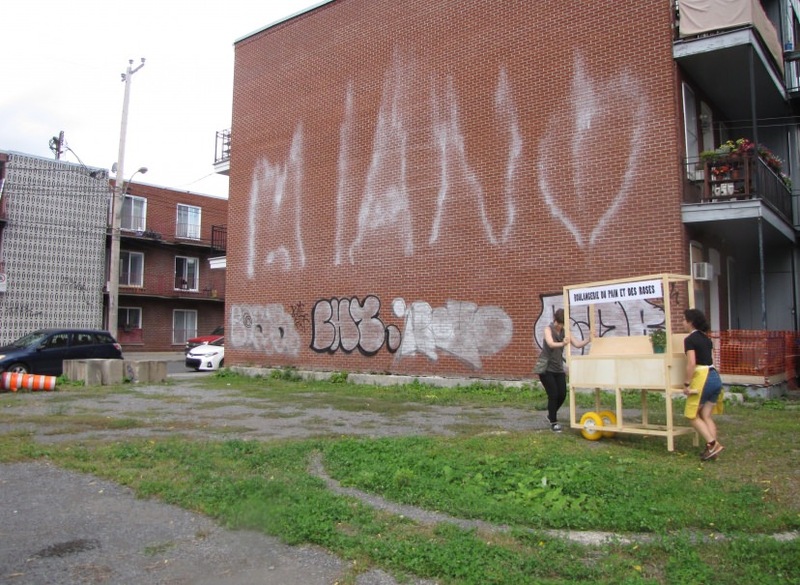 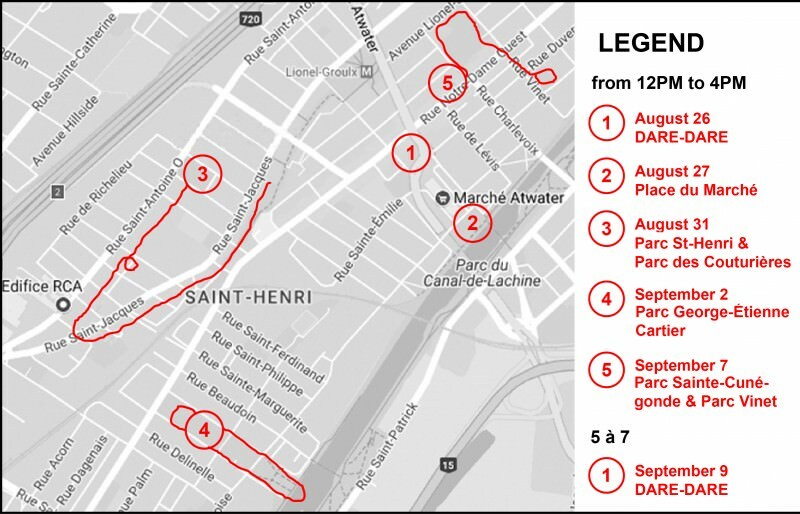 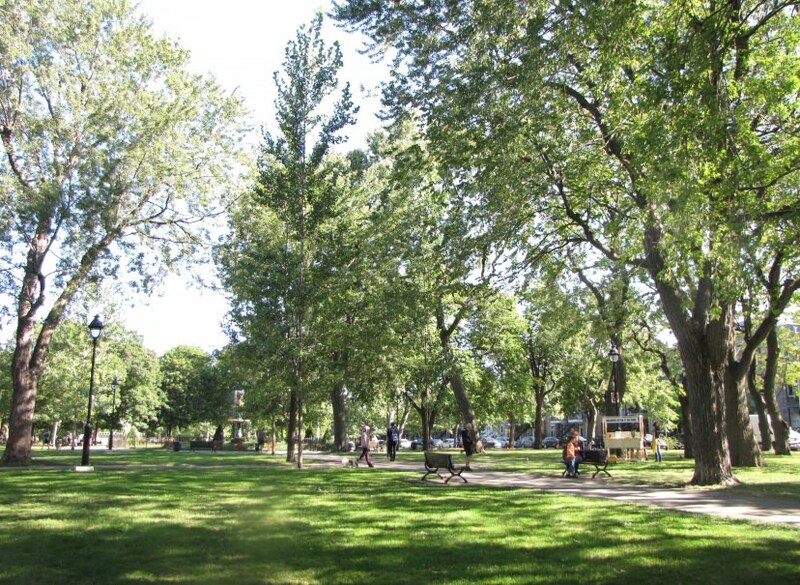 However, with the gradual increase in rents that operates in the neighborhood, as in other parts of Montreal, workshops located in, among others, the RCA and the Lachine Canal Complex are becoming less and less affordable, an essential component to be able to work. 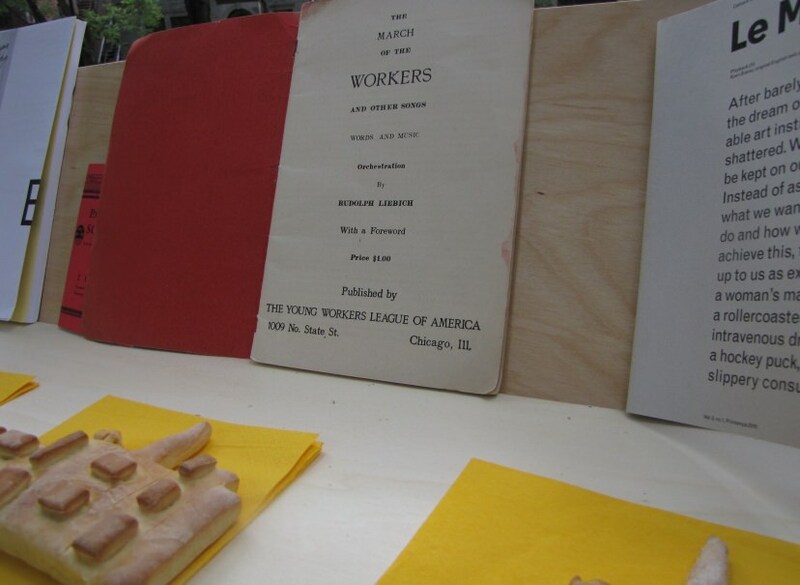 The slogan "bread and roses", chanted in several workers' popular struggles of the 20th century, and taken up again in 1995 at the March Against Poverty organized by the women's groups of Quebec, is still valid to claim better conditions of work for the artisans of culture. 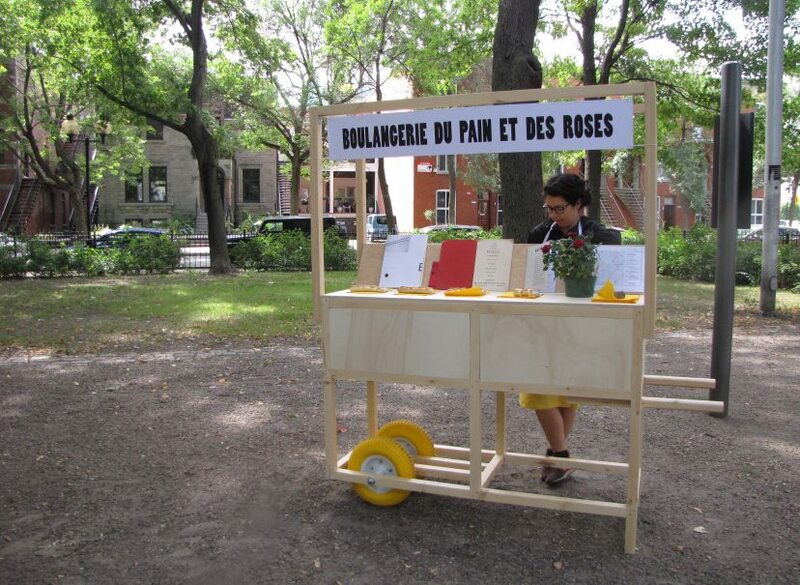 As an artist, we ask for bread, but also for roses, which is a higher quality of life related to our livelihood. 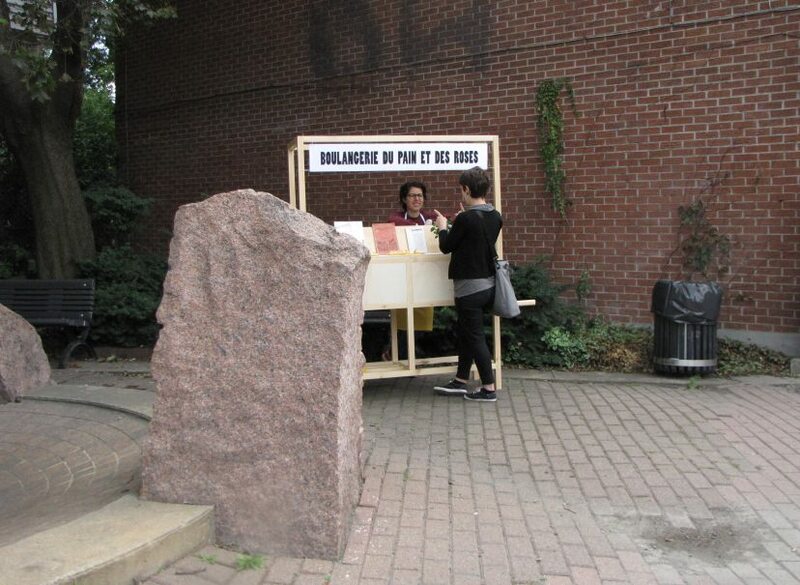 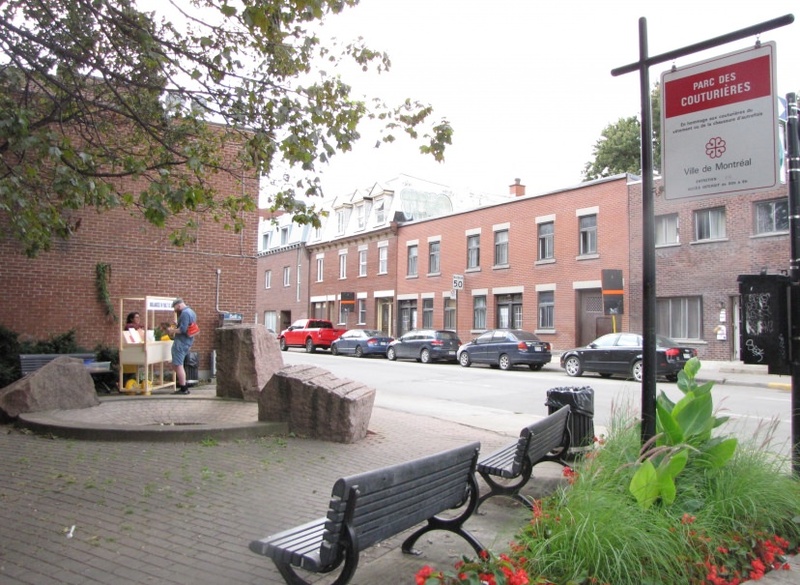 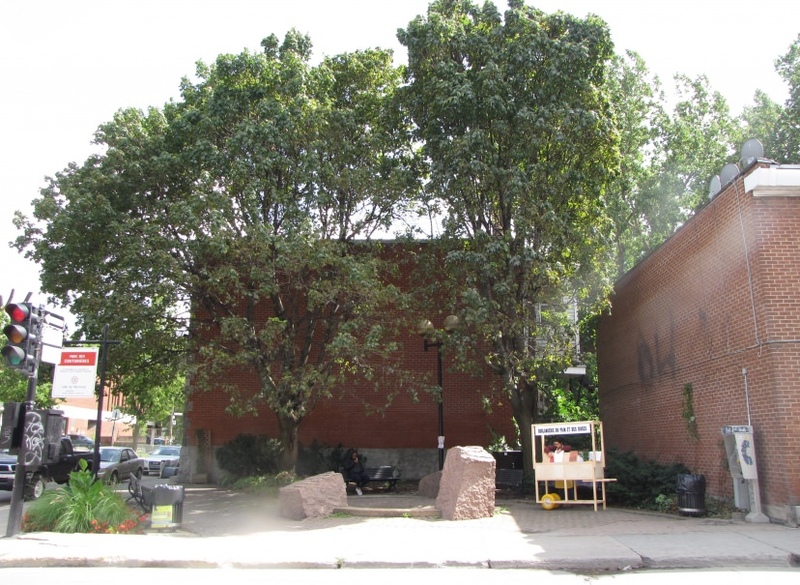 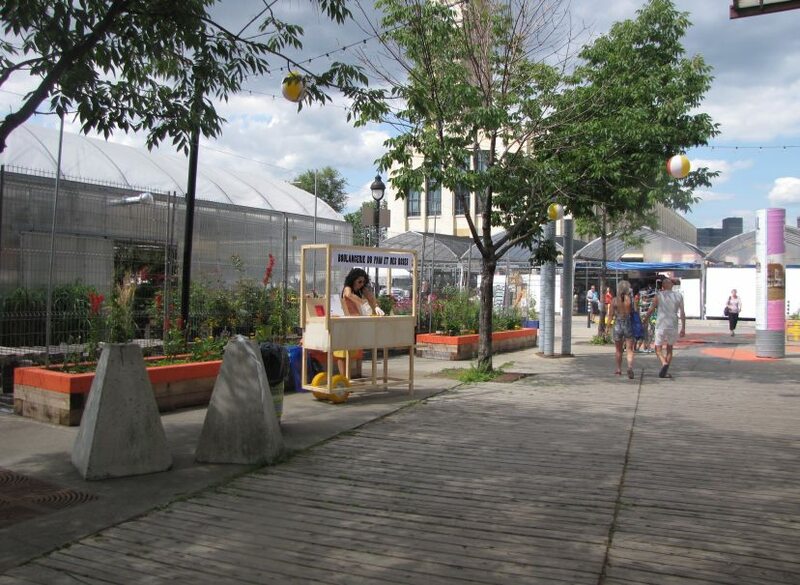 The Bread and Roses Boulangerie will consist of a kiosk that will run through various Saint-Henri hirings during the project, and will offer free bread bearing the typology of the iconic industrial buildings of the neighborhood. 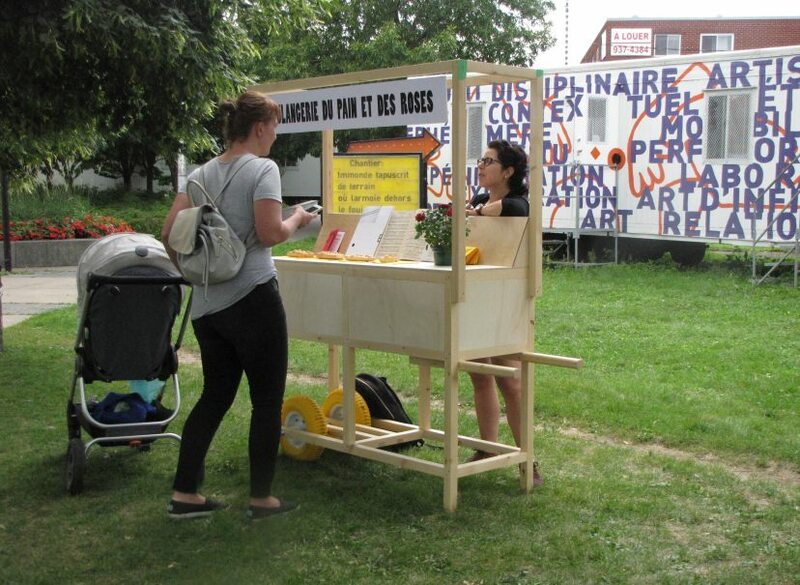 The kiosk will also feature publications such as Troubler la fête, rallumer notre joie of Journée sans culture. 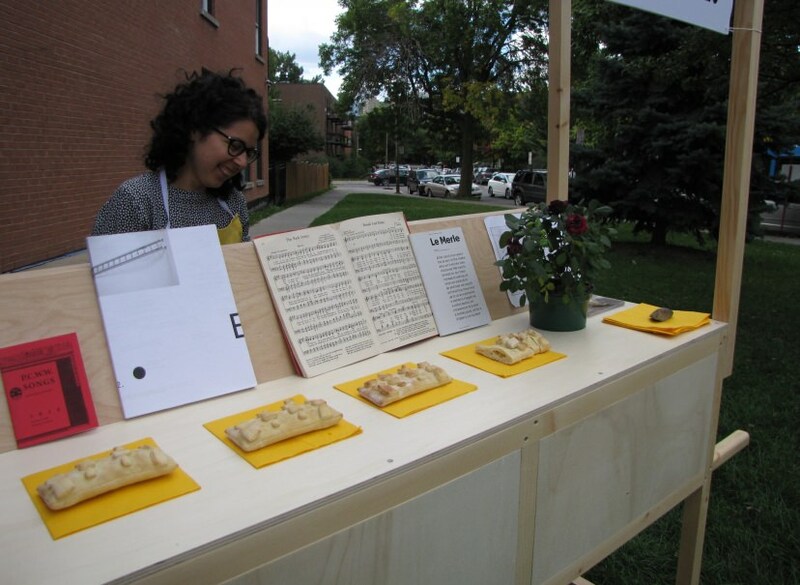 These temporary interventions will be an opportunity to reflect on the role of art in our lives, including feeding on a daily basis. 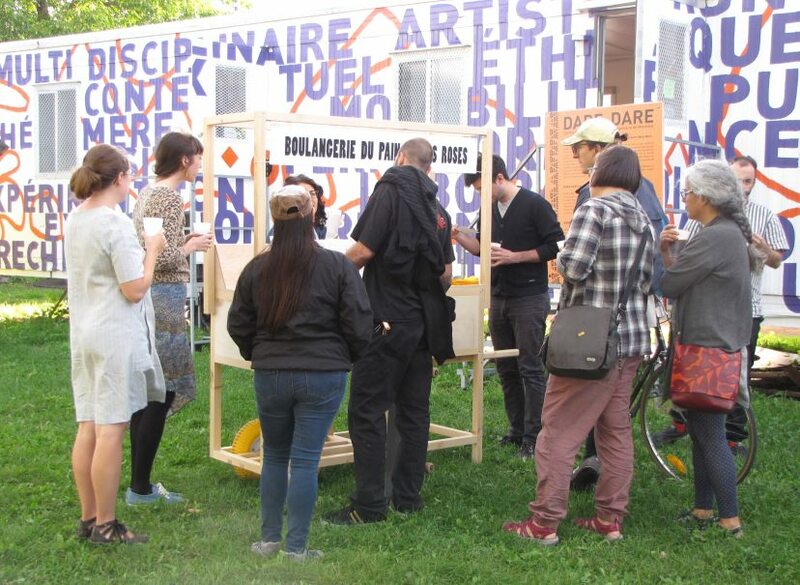 Closing event in the presence of the artist on September 9 at 5 PM, at DARE-DARE. 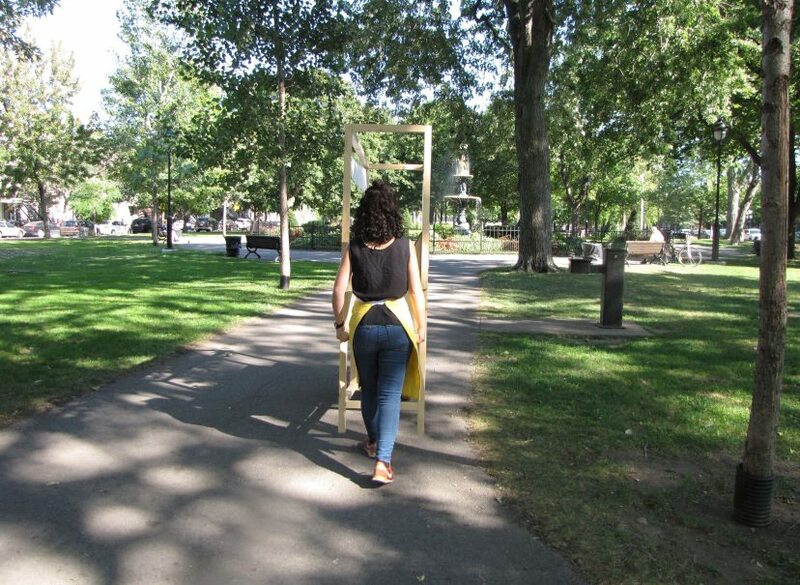 My artistic practice takes the form of temporary interventions, participative performances, Eat Art and photographic projects, and explores various issues related to the natural and urban environment. 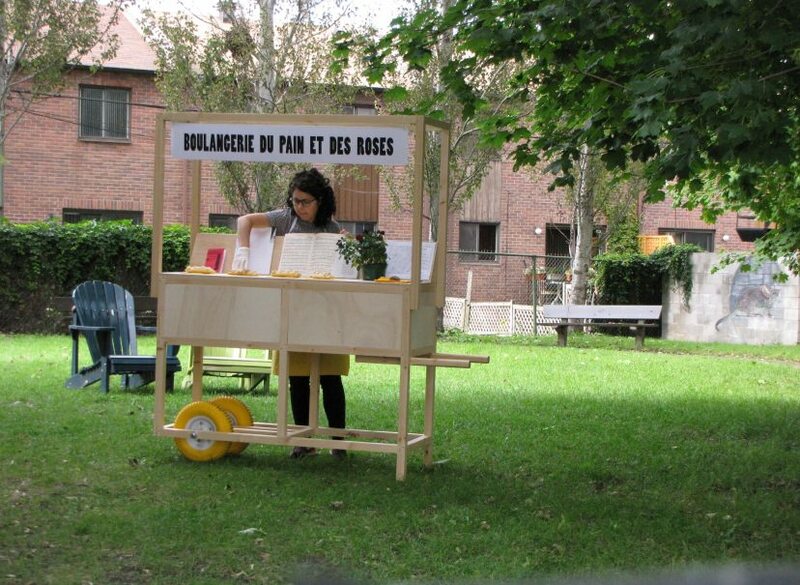 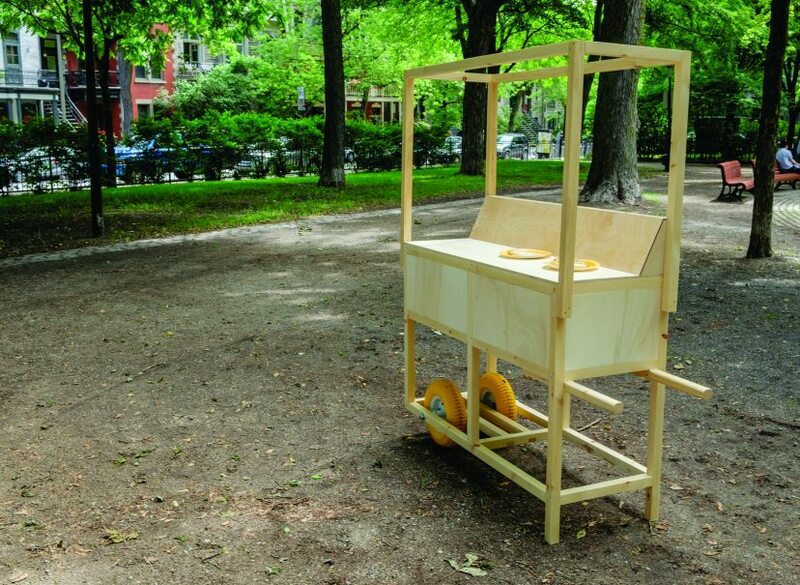 In my more recent projects, I am looking for ways to recreate spaces in nature and in the city, with the design of props in order to challenge our perception of pre-established social and spatial systems. 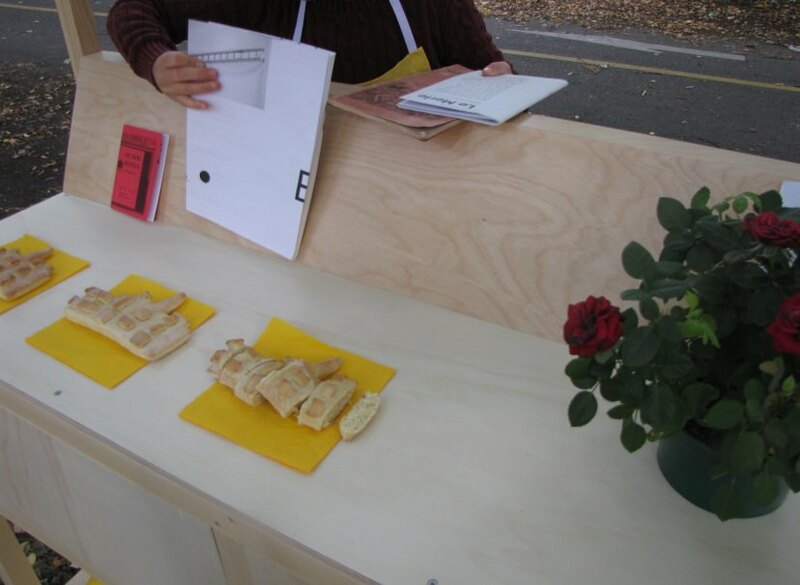 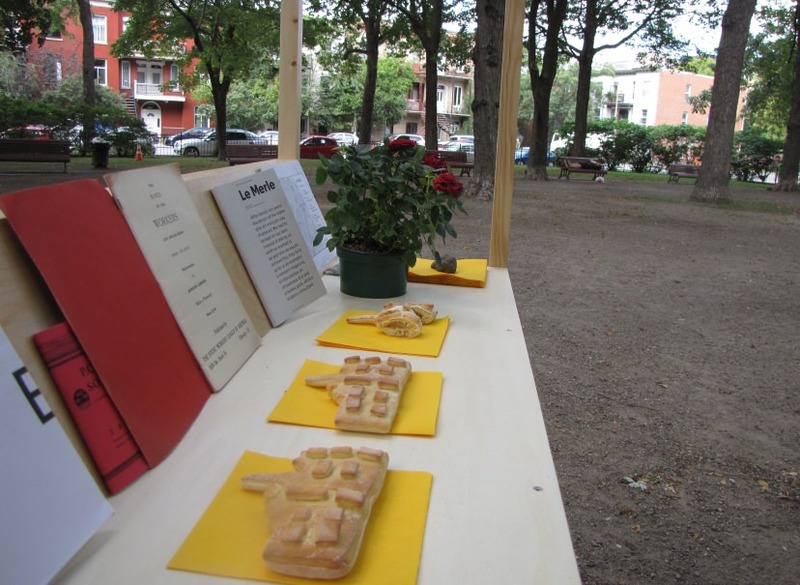 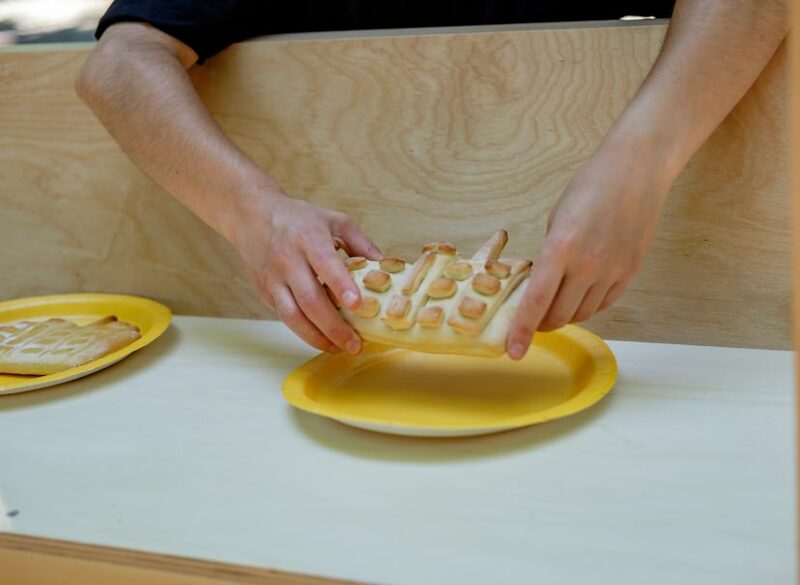 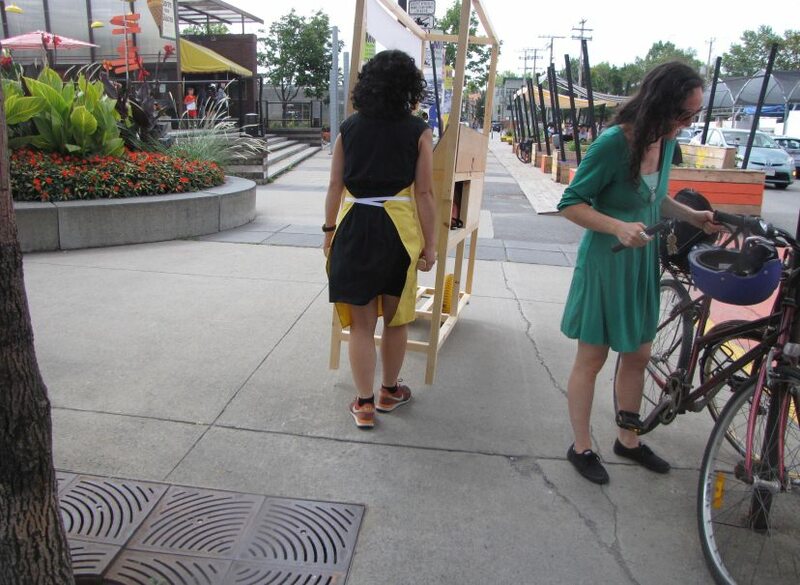 My interest in food has led me to design several participatory performances in the public space involving, among other things, the action of cooking and eating bread. 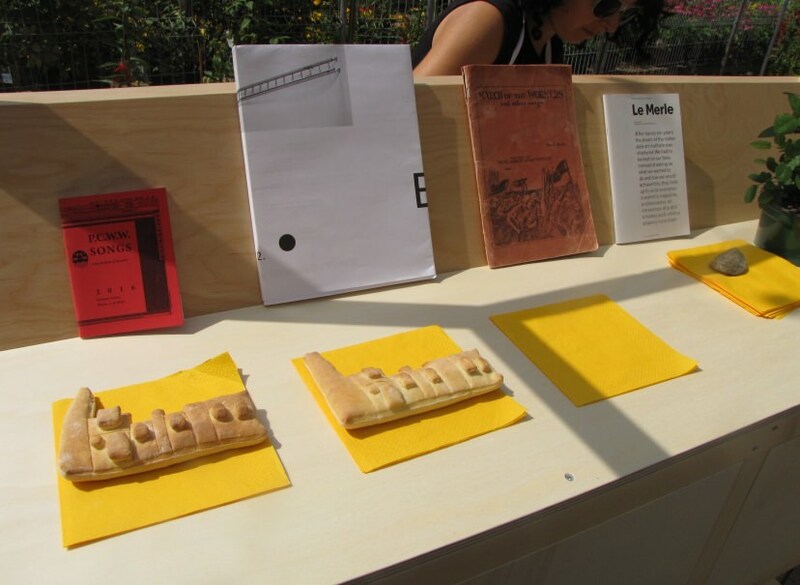 As a basic commodity in most societies, bread evokes the values of sharing and social justice, as well as encouraging conviviality, which make it a particularly evocative medium for conveying ideas. 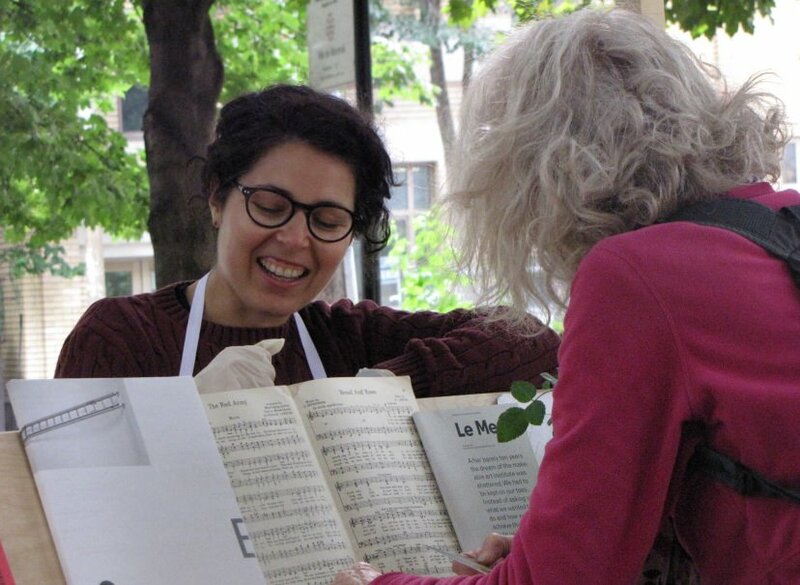 I support artistic and educational initiatives that have a positive impact or help build communities, and contexts that encourage collaboration, inclusion and experimentation. 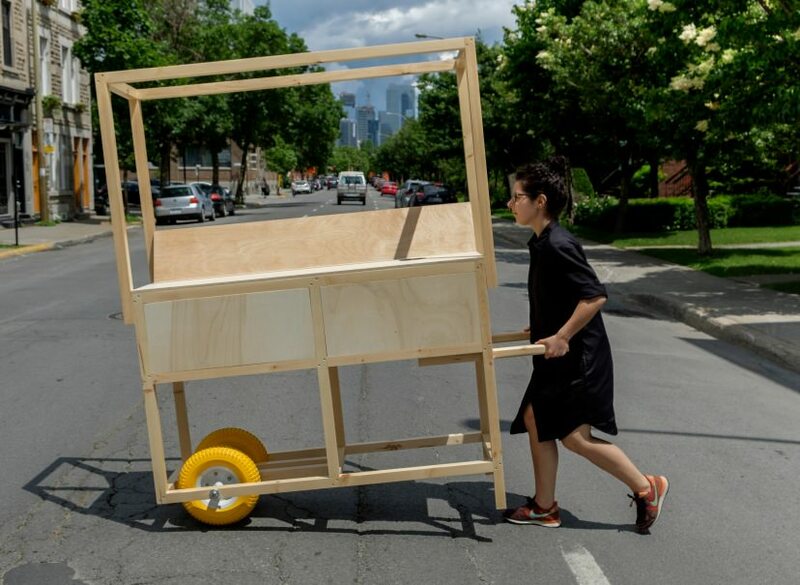 The artist would like to thank Atelier Clark for the technical support in the creation of the mobile object, as well as DARE-DARE for the accompanying during the realization and presentation of this project.